During the 20th Century various improvements and modernisation took place. Gas lights gave way to electricity. 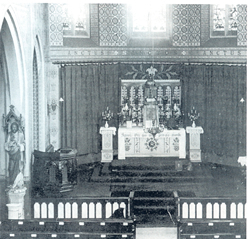 The wooden altar was replaced by a marble altar together with marble communion rails in 1923 and a new organ was installed in 1831. Stained glass side windows and the large east window depicting the seven sacraments were introduced in 1932 and three years later a new version of the Stations of the Cross was added. 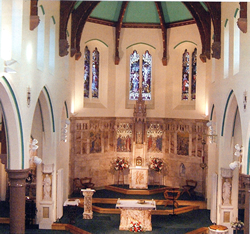 During the early years of 2000 the church underwent major refurbishment of both buildings and grounds. A new centre interior door at the rear of the church was created and improvements were carried out to the hall, presbytery and day chapel/meeting room. The car park was resurfaced and new railing and gates added. The parish war memorial was moved to a more prominent position. Work began on the interior in January 2004 and the church was closed for two months. During this period, the Saturday evening Vigil Mass was held at St Wilfrid’s, a very generous offer which emphasised the close working relationship between the Standish churches. 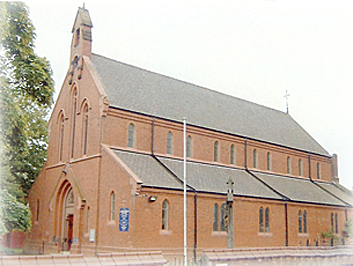 The Sunday morning Masses took place in St Marie’s school hall. When the church reopened in March 2004, its appearance was stunning. A new marble altar and lectern had been installed, the baptismal font re-sited, the main and side altar rails removed as well as the overhead heating lamp, the central isle widened, new spot lighting introduced, a new sound system installed. New carpeting throughout had been laid and the whole church re-decorated; a contrast of colours, vibrant yet reverent, to serve its congregation in the 21 st century.